For this installment of the “geek of the week” I had the opportunity to ask Goto80 a few questions. I tried to keep the questions as open as possible so those looking for information gearding on how to make chiptune music could get a little help. Better to learn from one of the masters, than to go at it alone. NerdArts:What software/hardware do you use in composing your pieces? Goto80:Mainly JCH’s Newplayer for C64, Protracker for Amiga, Renoise for PC and LSDJ for Gameboy. NerdArts:What was the piece of hardware/software which got you interested in creating chipmusic? Goto80:I started making music on the Amiga, but more sort of non-bleepy styles and more like slammer-trash-rave-acid. Then I got into making chiptunes on the Amiga, as the chipmod-songs were extremely popular in the Amiga demoscene. A few years later, I realized that the C64 was what I needed to get that nice mix of digital and analogue - pure and dirty. NerdArts:Advice for those who are starting out. What would you say are the absolute basics that someone would need to start making chipmusic? Goto80:Well as far as chipmusic in general, there are no basics because there are so many different ways of doing it. If you are gonna get into the purist chiptune stuff - using only old computers, etc, then I guess you need to know how a tracker works, which mostly also means understanding that there’s a hexadecimal number system. (instead of just 0-9 there’s 0-9 and A-f .. eh, google it) You’d probably want to learn how to transfer files between your lamer-computer and your cool-computer. Anyway - I still believe that trackers are extremely fast and easy to use, just takes a bit of time in the beginning. To get into the idea of tracking, you might want to try Renoise for Mac/PC because it’s pretty similar to oldschool trackers only now you can use VST-thingies and blabla. NerdArts:How do you feel about chipmusic becoming more popular? Do you think it has a chance to go mainstream? What’s the current scene like in Sweeden? 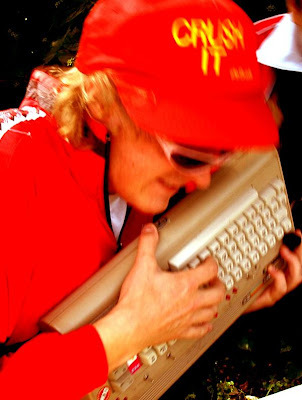 Goto80:A lot of people think that the chipmusic scene in Sweden is very big and it is true that there’s many people that know about it. But I think that it’s the same as with other non-mega-mainstream-music scenes in Sweden - there’s a lot of people making it, but there’s not a good live music culture in our country. Chip music has already been heard in mainstream music such as Timbaland, Beck, Malcolm McLaren, etc. 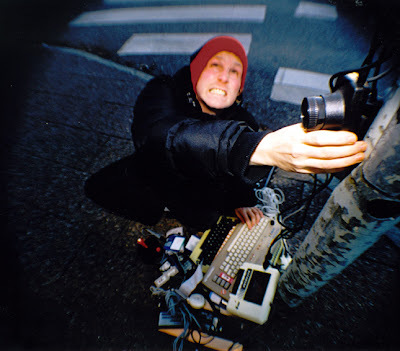 Using old computers to make music fits well with current trends of DIY and “obsolote” equipment and in a sense that novelty perspective of it is already mainstream, mysteriously formulated by journalists and thinkers. Anyway - as chip music gets more attention in mainstream forums that means more people get into it. The good thing is that all these non-demoscene-nerds that’s been getting into it since the year 2000 bring alot of fresh ideas into the music. Early on you might get the feeling that “the others” don’t understand “our” scene and blablabla, but personally I’ve dropped that perspective. NerdArts:Were you classically trained in music or self taught? How has musical structure effected your pieces? Goto80:I’m self taught and used to have a strong disbelief in rules and theory about music. But I started getting a bit more interested in theories and “models” of music which made me realize new ways of breaking them. I’m not all that convinced anymore that a single individual independently can be inventive all through his or her life, and there’s alot of people whose music (or art, or whatever) I would appreciate more if they would be more “conscious” in their breaking of rules. Hm, or something. But I guess that’s very non-trendy and conservative to say, hehe. Goto80:I’ll be going on a European tour in August and a little tour in Israel in October. I’ll keep doing one free MP3-release every month and also I’m working on a CD-album. I will also do music for some incredibly fresh C64-releases, all released at the Big Floppy People party in Sweden in July. I’ll have an article published about chip music next year, in Kate Collins‘ book “From Pac Man to Pop Music” and I hope to be able to spread some more interesting ideas about chip music than just the “hacking videogames retro bleep yeah funny”-thing. Chip music does (still) have a somewhat unique styles when it comes to composing and distributing, and I think that needs to be said. So I hope I can do more talks in the future about this.